Tan - Rose - Mint - White. Due to availability - colours are packaged at random. 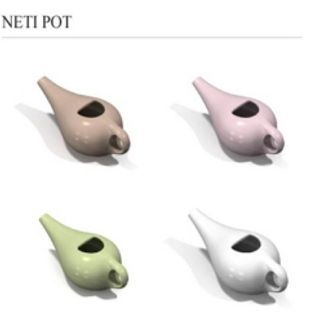 BENEFITS: The Neti-Pot is used to ease sinus and allergy problems. The "SOLÉ" solution used - is a water and salt combination that is said to have a wide variety of health benefits. Salt has cleansing properties and a daily SOLÉ solution is also believed to help balance overly acidic pH levels. It is a simple, drug-free way of reducing allergens in the nasal passages, clearing sinuses, soothing nasal passages, and allowing free breath. Nasal passages are clear and moisturized. Great for winter colds, allergies, stuffy noses of all kinds. Individual results may vary. An ancient practice praised all over the world as a simple, drug-free way of reducing allergens in the nasal passages, clearing sinuses, soothing nasal passages, and allowing free breath! Feels great - and afterwards your nasal passages will be blissfully clear and moisturized! Great for winter colds, allergies, stuffy noses of all kinds. Opens nostrils for easier breathing - an aid in reducing pollen and allergens - Clears excess mucous - Relieves dryness. Nasal congestion and respiratory problems are on the rise, due to increasing pollution to our environment, along with poor indoor air quality. 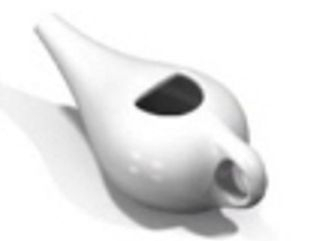 Nasal passages can get blocked from dust, chemical cleaning supplies, air pollution and other irritants, so its important to clean nasal passages out using the NETI-POT... at least once a day! When mucus is blocking a sinus passage, bacteria can start to grow. Your body fights the cold virus by making mucus which helps the virus out of your nose and sinuses. The lining of the sinuses swells and the mucus is partly blocked. This is called Sinusitis. Nasal cleansing is a basic health maintenance activity, just like taking a shower or brushing your teeth. It's easy to do - you start out... in the shower (preferably) that way there is no mess and you can practice until you get it right! It may take a few tries...! Basic info provided on this product. What does safe use mean? First, rinse only with distilled, sterile or previously boiled water. Whether for a child or adult, talk to your health care provider to determine whether nasal rinsing will be safe or effective for your condition. If symptoms are not relieved or worsen after nasal rinsing, then return to your health care provider, especially if you have fever, nosebleeds or headaches while using the nasal rinse.